April | 2010 | It's a Miracle! A chance encounter with a copy of the October 1943 issue of the National Geographic magazine at a library book-sale piqued my interest since the headline article was about British India. I have always had more than a passing curiosity in the opinions of the British ruling-class during the days of the Raj. What did they feel their roles were in India? Were they simply traders forced into ruling uncivilized natives that knew no better? I had to find out what this authors’ opinion was so I purchased the magazine on the spot. The article written by Lord Halifax, Viceroy of British India from 1926-1931 combined elements of genuine interest in the affairs of India with unapologetic views of the role that the British played in shaping it. Some of the broader themes in the article are commonly found in many other articles written by authors of similar origin and social-standing and are worth pointing out. Of course Lord Halifax is referring to the Princely States in this passage and delineating them from the eleven Provinces which at the time formed British India. In my opinion, Indian school history textbooks do not adequately describe the powers vested with the Princely States during British rule and only nominally mention the larger of these States in the context of the political integration of India orchestrated effectively by Sardar Vallabhbhai Patel. It would not surprise me if the Indian Princely States were willing allies of the British Crown considering it was in their vested interests to support feudalism. However, does simply saying that the Princely States were happy campers that supported the British acknowledge the realpolitik of the climate? Did the rulers of these Princely States have any reasonable choice? The second thought pervasive throughout the article is the notion of India as a conglomeration of states cobbled together only by the presence of British ruling elite. Although the Mughal Empire had successfully consolidated much of what later became British India, there is arguably, some credence to this twisted notion. Strong opposition to a ruling class can often be a catalyst for unification of disparate races or tribes. Dislike for the British might not have been the predominant unifying force, but it certainly might have been one of many. Again, the tone is defiant. The British were, according to Lord Halifax, unwillingly forced to take on the mantle of ruling India because of a void in leadership. Unfortunately, an external, perceived need for unification is paternalistic and rooted in the colonial mindset. Here, there is a sense of resignation that the passing of India from British hands is inevitable. But the passage also reeks of a paternalistic attitude. Did the British know what was best for India? It is an irrelevant question when taken in context of the political disenfranchisement of the people of the land. Who was to say what was good or bad if the people had no voice? Lord Halifax is completely unapologetic and also continues in the vein that the conquest of India was an accident of history. An accident, perhaps, but weak moral justification even when combined with the preceding “we-know-what-is-best-for-India” attitude. Lord Halifax also attempts to preempt any harsh criticism from American readers (he was the Ambassador to the US at the time) by sermonizing on the shortcomings in the early history of the US. As a debater , I can admire this sort of wily rhetorical maneuvering; as a rational thinker, I find the underlying logic disingenuous. I will concede that the author does, however, have a point with respect to the concept of nationality and nationalism. From a sociological standpoint, the concept of communities involves including those that “belong” based on shared traits and excluding those that do not because they do not share the same traits. It is the role of any successful government to foster the sense of community among citizens. In modern India, these concepts coalesced around many nuclei (which included, as I pointed out, opposition to British rule). The final comment worth mentioning from the piece discusses relations between Hindus and Muslims. Throughout the article, Lord Halifax expounds the view that there are fundamental differences between Hindus and Muslims which are irreconcilable. I leave you to ponder on this viewpoint in light of the events of the last sixty-seven years during which time Pakistan was carved out of India, and Bangladesh out of Pakistan. Notwithstanding my criticism of the article, I found it to be a provocative read, if for nothing else then for gaining insights into the mind of someone so intimately associated with the history of the South Asian subcontinent. In 1999, Pappu Patligali “passed out” of the New Elite Institute of Technology with a job in hand. He had been recruited on-campus by Technotomorrow, an IT firm that promised to send gullible prospects on-site to their Connecticut branch to work on VLP (very-low priority) coding solutions for the Y2K problem. Technotomorrow wasn’t innovative and they certainly didn’t pay well, but their share price kept skyrocketing. They had adopted a simple business model: they hired engineers straight from the state colleges for as cheap as possible, trained then in the minimum skills necessary to do the job, and worked them until they quit for better paying jobs. A constant supply of fresh engineers ensured that they could undercut the major IT competitors, and a cadre of perennially-angry managers with no technical skills made sure that deliverables were always on time and on budget. After six months of working in a converted-godown in NOIDA, Pappu decided he had had enough. He called it quits. In the meantime, he had looked up graduate engineering programs in the US and had taken the GRE. He hired a professional editor to write his required “statement of purpose” and letters of recommendation. He applied to twenty graduate programs and got a few nibbles. Most of them panned out into “we regret to inform you” letters. however, after an extended dance with a potential Master’s thesis advisor at a very small program, he received a coveted letter of admission. By the time Pappu was ready to leave for the US, he was very well-prepared. He had taken the necessary medical checkups, bought cheap textbooks for courses, found temporary housing and potential roommates, and contacted his advisor. The Office of International Students at his school had been particularly helpful in making sure that he would have everything he needed to make a smooth transition. Or so he thought. What the Office had not told him was that he was about to have The Conversation. For Pappu The Conversation happened the day before his flight out of India. Pappu was sitting in his room at the time trying to fit 200 grams of besan laddoos into a pressure cooker. The pressure cooker was going to go into Suitcase Number One which was exactly 200 grams less than the maximum permissible weight for checked-in baggage. “Make sure you have the Gita and the framed picture of Guruji with you at all times,” said Pappu’s father who was now standing in front of the door. “I have put the tulsi–chandan in his moneybag,” said Pappu’s mother agitatedly as she joined him. Pappu was a bit upset that his parents had been going through his things and had inserted various divine charms without his knowledge. Still, he didn’t dare to defy his father or to hurt his mother’s feelings especially since he was about to leave the country. Pappu sat still. He had heard these stories before, but was puzzled why his father was mentioning them to him now. It had already been decided that Pappu would be coming back, although no one had told him. Pappu’s father cleared his throat and the continued. “Remember to recite the Gayatri Mantra every day during your bath. Never touch alcohol and other impurities. Stay pure and eat only satwik food. Remember cow is like your mother.” (Pappu was glad that his father didn’t say it the other way around). What was his father talking about? “Which direction?” asked Pappu. “That direction,” repeated his father as if it was self-evident what he was referring to. When Pappu finally understood what his parents were hinting at, his face turned bright red. Just the previous day his friend Bhola has infuriated him by saying “Going abroad, Pap-pu. Everything there is open, no?” At the time Bhola was winking and nudging like a professional Kathakali maestro. But you could expect Bhola to say stuff like that. Bhola was a philanderer. These were his parents. “I want you to touch your mother’s feet and vow that you will not go in that direction,” said Pappu’s father. Pappu was uncomfortable. Not because he had any impure thoughts in his mind at that time, but because he was being asked for an agnipariksha by his parents. Pappu revolted in his mind. He would not put up with this embarrassing situation. He froze. All three of them were quiet for what seemed like hours. Pappu’s parents were staring at him trying to gauge his reaction. Pappu was looking straight at the ground and hoping it would open up to engulf him like it had swallowed Sita. Pappu’s father nodded. Having somewhat convinced themselves that they had done their duty, Pappu’s parents left the room as mysteriously as they had come in. More of the Charmed Life of Pappu Patligali here. It took me six years to complete my Ph.D. It has taken me over sixteen years to come close to completing my collection of all of Rahul Dev Burman’s released music. My personal journey began just before Panchamda died in 1994. Over the years I’ve laughed, cried, fallen in love, and celebrated the seasons of my life with his music. So when I heard that Asha Bhosle was coming to town to perform in the 2010 “Rahul and I” concert along with Sudesh Bhosle, I had to go. Ashaji has always been my favorite Bollywood playback singer and I’ve grown up listening to her from a very early age. I didn’t know who Panchamda was, but when I was three I sat by the gramophone and sang along to “Kine de reshmi churi,” one of the evergreen non-film Bengali gems that everyone in West Bengal knows. Twelve members of R.D. Burman’s orchestra come up to the stage and start playing. I recognize the tune after two seconds of the intro. Sudesh Bhosle comes on stage and starts singing “Bachna ae haseenon” from Hum Kisise Kum Nahin. The crowd goes wild. 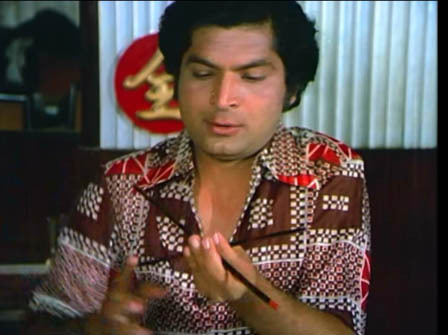 Sudesh moves effortlessly on to another Kishore Kumar song, “Kehna hai” from Padosan. The orchestra plays the song to perfection. Not a note missed in the preludes or interludes, and I should know I have the notes memorized. After “dekha na hayre” (Bombay to Goa) and “Jahan teri yeh nazar hai” (Kaalia), two songs with lyrics by Majrooh Sultanpuri, Ashaji comes on the stage with the sizzling number “Mera naam hai Shabnam” from Kati Patang. She is almost 76 and she still brings down the house with the high notes. Ashaji then sings “Aaja aaja main hoon pyar” from Teesri Manzil. Teesri Manzil is one of the first cassettes that I ever bought. I bought it in an HMV combo-pack with number of non-RD film scores. At that time I was a huge fan of Rafi Sahab and liked his voice even better than Kishore Kumar’s. Cassettes I had back them include scores from films such as Mere Sanam and Kashmir ki Kali. I was really into Bollywood music from the 60s and 70s. 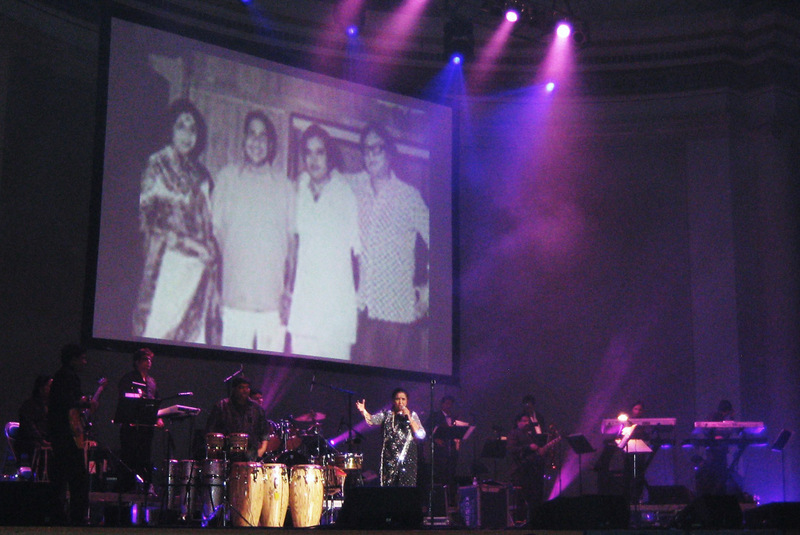 Ashaji sings a few other memorable numbers sharing anecdotes of her relationship with Pancham with the audience. Later in the night Sudesh Bhosle comes back on the stage and they sing “Jaan-e-jaan dhoondta phir raha” from Jawani Diwani. I think back to the one of the most vivid memories of chotomama, my uncle. My uncle is getting married and I am one of the barjatri going on the bus. We have no music, so I ask chotomama to buy a cassette. He gives me one of the most memorable compilations in Bengali in modern history – Mone pore Ruby Ray with Ashaji and Panchamda’s Puja numbers. One of the numbers on the cassette is the Panchamda-Ashaji duet “Janina kothai tumi”, the Bengali version of the song in Jawani Diwani. Years roll by. HMV becomes Saregama. Cassettes become CDs and them mp3s. That cassette still reminds me of chotomama. On the stage, Ashaji starts singing Chura liya from Yaadon ki Baarat and the crowd goes crazy again. The crowd chants “once more, once more” once she is done and she gifts them with the “sajaonga…” stanza originally sung by Rafi Sahab. I am in college. I have floppy hair that brushes my ears. I wear baggy trousers and a black jacket with a print of a scorpion on the back. Ashaji has just released the Rahul and I album with compositions rearranged by Leslie “Lez” Lewis. I am trying to figure out the chord structure of the original and cursing my parents for insisting that I study instead of learning to play the guitar (which is what I want to do). I convince myself this is a song that I’ll have to learn if I’m to ever become successful in my love life. Ashaji is requested by someone from the audience to sing “Sanam teri kasam.” One of my wishes come true. This song has amazing chords played on keys and Ashaji’s version from Sanam Teri Kasam is better than Kishoreda’s in my opinion. Two friends with no careers, no future, no jobs, and no ambition are riding bicycles around town aimlessly. Sanam Teri Kasam, Love Story, Romance, Teri Kasam. We are singing songs from this sparkling phase of R.D.’s career, mostly those in the voices of R.D. Burman and Amit Kumar. Ashaji continues with songs from the early 80s. 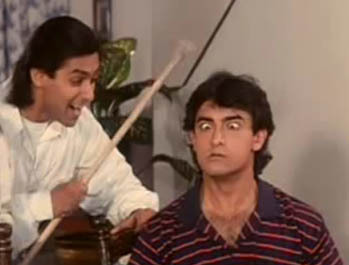 “Poocho na yaar kya hua” and the eternal classic “Yeh vaada raha”. The band is playing to perfection and I am snapping my fingers on cue. Then Ashaji moves on to numbers that the audience has heard many times. She sings Dum maro dum and “Piya tu aab to aaja”. Sudesh comes back on the stage and starts singing the Rafi number “Kya hua tera wada” from Hum Kisise Kum Nahin. Showing an amazing versatility in his vocal range, Sudesh sings in voices reminiscent of Kishoreda, Panchamda, and Rafi Sahab in the famous medley from the film that includes “Chand mera dil”, “ae dil kya mehfil”, “ho tum kya jaano”, and ending with “mil gaya humko saathi.” Each song is exceptionally tough to perform, but the notes are perfect. The brass-section is truly amazing. “Yaadon ki baarat/Hum kisise kum nahin” is the first audio CD I ever buy. I don’t even own a CD player at the time, so I listen to the songs on my computer. The quality of the music is exceptional and I can hear segments that I couldn’t before on cassette. Ashaji quietens the audience and starts to sing “Mera kuchch saamaan” from Gulzar’s Ijaazat. There are no instruments playing in the background. I have heard this song so many times, but I am enthralled. This is the most magical moment of the evening for me. Gulzar, Pancham, and Asha made a lethal combination. I think back to purchasing Dil Padosi Hai a non-film album with exceptional songs. I think about some of the other albums with songs written by Gulzar – Masoom, Libaas, Kinara, and Aandhi. Stylistically, these songs are definitely my favorite out of all the types that Panchamda composed since they show an unparalleled understanding of both Western and Hindustani music. So many evenings singing “Tujhse naraaz nahin zindagi” and “Huzur is kadar”. The night is coming to a close. Ashaji sings a few more songs, all amazing RD creations… I’ve heard before countless times. It is like a religious experience for me that I don’t want to end. As I make the trip back home from the concert, I reflect on the experience. I never had a chance to hear Panchamda in person. He died just as I was coming of age. But his music is tied in with so many memories. Tere bina zindagi se koi shikwa to nahin… Tere bina zindagi bhi lekin, zindagi toh nahin. One of the leading causes of death in India, Pakistan, and Bangladesh is hypothermia. Rough back-of-the-envelope estimates tell us that without treatment one person dies from this horrible acute affliction every three minutes in the winter months (within an acceptable margin of error). In the summer months, the rate only decreases slightly to one person every 3.1416 minutes. Unfortunately, South Asian governments choose to dedicate resources disproportionately to other ailments such as malaria, tuberculosis, infant diarrhoea, heart disease, cancer, and AIDS. This is unfortunate since experts are of the opinion that “the cold sleep is the sleep of death” (“sardi ki neend maut ki neend hoti hai” vide Ganga, Jamuna, Saraswati). With these conclusions firmly established, the Bollywood Hindi film industry has lead some trailblazing research in finding proper treatments for hypothermia. In this research article, the state-of-the-art in Bollywood hypothermia treatment for male and female patients is discussed. For the first time, exact details of how this treatment is effective are presented to the medical community. Heat conduction obeys Fourier’s law, which states that the time rate of heat transfer through a Bollywood movie star is directly proportional to the negative gradient in the temperature of the hypothermic hero or heroine and to the area at right angles, to that gradient, through which the heat is flowing. Using the integral form of Fourier’s law, Bollywood has successfully calculated the thermal conductivity of anistropic heat-generating bodies such as movie-stars for which many Hindi movie directors have been shortlisted for the Nobel Prize in Physics. In Figures 1 and 2, experimental details of the heat-transfer hypothesis as method of treatment of hypothermia in female and male subjects, are presented . The exact mechanism by which this treatment works is outlined in the last panel of Figure 2. Fair-use rationale for images: All images are low-resolution and used only for purposes of demonstration for no monetary gain. Copyright of original works resides with the original creators.